Watch the closing moments of a tense deciding frame as Stuart Bingham holds his nerve to beat Judd Trump and get through to his first World Championship final. Trump trailed 13-9 but produced a fine comeback to take an absorbing semi-final to the wire, with Bingham triumphing 17-16 to book his place against Shaun Murphy. 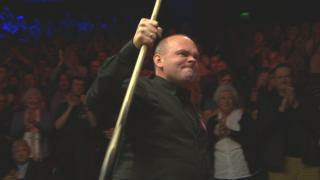 Speaking to Hazel Irvine and Steve Davis after the match an emotional Bingham describes the feeling of making the final as "unbelievable".